The Partners Table is supported by a version of our stabilized beam design. Combining this trestle assembly with an Appleply tabletop results in a lighter table with a high proportonal core weight. 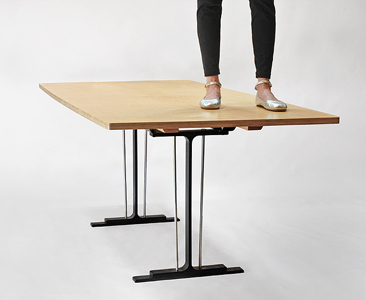 The end cantilevers of the these tables are reinforced with maple stretchers that fit inside the steel trestle frame. The Appleply tops are Forest Stewardship Council certified and are finished with a UV cured clear epoxy. The tables are available with the original 1/2" steel floor supports, or our new red or black flange shoes. Width 36" Length 80" Height 28.5"
US Patent 11/503,724, Reg. EU Community Design.